WHAT IF YOU GOT ONE LAST NIGHT WITH YOUR FRIENDS BEFORE YOU LEFT FOR WAR? Stephen Radcliffe Archer was far away from his family and friends in a foreign country, but on the 9th of January 1915 in Cairo, he got to feel like he was back at school again. That night a dinner was held at the Continental Hotel for Old Boys of Wanganui Collegiate. Forty of the men who attended the dinner signed the menu card. Sixteen of them were killed in action a few months later, many of them at Gallipoli. Stephen was one of them. Stephen had always been a big part of school life during his time at Wanganui Collegiate. He’d been on the shooting team and the 1st XV. After his death at Gallipoli, his Lieutenant, (who had gone to school with him at Christ’s College) said, “He was without exception the finest man it has been my lot to meet." 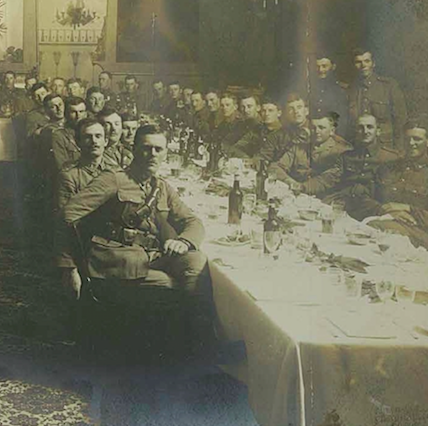 School had been a huge part of these young men’s lives and for just one night they didn’t have to be soldiers heading off to war, they could just be Old Boys, having dinner together. You have been given a photo of the Wanganui Collegiate Old Boy's Dinner at Cairo in Egypt. Stephen attended the dinner and the organisers sent this signed copy of the photo home to the Headmaster. You are now tasked with discovering more of the story behind Stephen (Rusty) Radcliffe Archer. How much of his story can you piece together? The suggestions below will help you on your research journey. The When We Search Fact Sheet will also be a helpful tool in helping you discover the pieces of Stephen's puzzle..
You're in luck. Stephen served in the New Zealand Army so his records can be found online at the Auckland War Memorial Museum Cenotaph. This is your most important search. Collect as much information as you can. Once you've found Stephen's Serial Number move to Archway and search for his service documents there. READ THE LETTER FROM STEPHEN'S FRIEND. Stephen's friend from Christ's College and Wanganui Collegiate, Anthony Hanmer, wrote this letter to Stephen's mother to tell her about Stephen's death. The Hanmers and the Archers had been family friends for years and it is clear that Anthony Hanmer was very upset by his friend's death. What happened to Anthony? Did he survive the war? WHAT HAPPENED TO THE OTHER MEN IN THIS PHOTO? The young men in this photo all attended Wanganui Collegiate. They all signed the menu card and sent a photo of the dinner back to the school. Back in New Zealand, The Wanganui Chronicle reported the dinner. Use Cenotaph to discover what happened to these soldiers. How many of them survived till the end of 1915? how do we know stephen went to christ's college? Stephen definitely went to Wanganui Collegiate but one of our questions for his family was if he had attended any other schools. Use Papers Past to search for Stephen Archer (remember to use all the forms of his name - Stephen Archer, S A Archer and even his nickname Rusty Archer). Can you find any reference to him attending Christ's College? How would you use the dates in the newspaper and his age at death to work out if he attended any school before that? where else is stephen remembered? Stephen's mother Amy Charlotte Archer (nee Radcliffe) donated something in the name of her son and her husband, Fulbert Astley Archer, to St Barnabas Church and remembered them both at Fulbert Astley Archer's grave in Waimairi Cemetery in Christchurch. Can you use Google Images to find any pictures of either of these two commemorations? The Archers were family friends with the Radcliffes both in New Zealand and in England so it was no surprise that Fulbert Astley Archer and Amy Charlotte Radcliffe would get married. Stephen's grandfather, Fulbert Archer, and his wife Mary came to New Zealand in 1867. They lived in Timaru. Use Google to discover any evidence you can find of the Archer lifestyle in Timaru (hint - it has to do with hunting dogs). What about the Hanmers? Where is their name to be found in New Zealand? what does the referEnce to 'warleigh' in stephen's obituary refer to? "He has fallen, a cousin rests in France, another has reached home from the Dardanelles after being reported dead. More than thirty of his kith and kin are under arms at Home. Warleigh, ever since the days of the Norman King Stephen, has continued to send from its towers and walls many devoted and some famous soldiers, but none more gallant that the noble youth over whom we mourn to-day. In Stephen Archer's Obituary reference is made to the legacy of soldiers since King Stephen's time that had come from 'Warleigh'. Warleigh was the traditional home of the Radcliffes (it is clear from Anthony's letter that he and Stephen had met and perhaps stayed with the Radcliffe family) and across the river Tavy lay the family home of the Archers - Trelaske. The families had been inter-marrying for centuries. Can you find an image of either stately home? A last dinner at Cairo is connected with the story of Stephen Radcliffe (Rusty) Archer who attended Christ's College and Wanganui Collegiate School. The original photo is held by Wanganui Collegiate School Museum. This story is told with the permission of Stephen Alpers and Elisabeth Frankish, on behalf of the Archer Family. Stephen Radcliffe Archer was a farmer from Toatoa. The Walking with an Anzac Team found the first clue in Stephen's story when they visited Wanganui Collegiate School. Stephen is listed on both the School Roll of Honour in the "Big School" as well as the memorial chapel. Further research on the same platforms you have used today allowed us to discover Stephen's Story. Stephens handwritten Service Records can be found on Archway here.